Services: Lead consultant, Consultation lead. 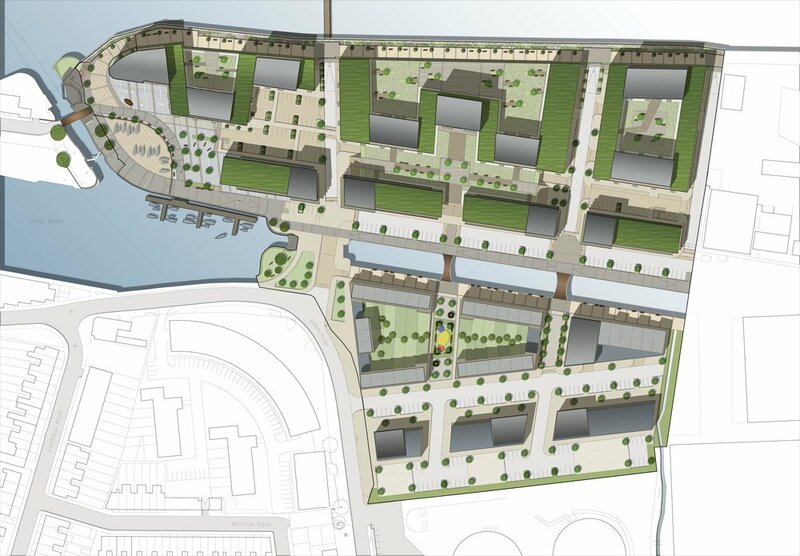 Albion Quayside is a mixed-use masterplan that will deliver 650 new homes along with shops, cafes and business units in Canal Basin, Gravesend. At the heart of the proposals are a series of superb new public spaces that capitalise on the riverside location: a new quayside square, a new riverside walk way and a restored canal and tow path. Arranged in three neighbourhoods, every part of the scheme is connected to the river side setting via a series of streets cutting through to the Thames. Occupying a 5.4 hectare site, the comprehensive Thames-side regeneration scheme required KC+A to navigate and overcome a series of complex challenges, including constrained highway capacity, flood risk, land contamination, nearby gas holders and even a WWII war grave. KC+A’s proposals also feature an innovative approach to flood risk mitigation that integrates control measures into the landscape and public realm. ‘Well done KCA great result! It’s been a long road but to win the unanimous support of the committee, and to have two speakers in favour on the night, is a real achievement. Thanks for leading the team up to this point.’ Conrad Birch on behalf of Feabrex Ltd.